Yay, the alternate reality of the “Tudor Legacy” series continues! If you aren’t familiar with this series, but it seems appealing to you, you need to start with the first trilogy: The Boleyn King, The Boleyn Deceit (reviewed here), and The Boleyn Reckoning (reviewed here). THE PLOT: Like the first trilogy, this new trilogy takes place in an alternate reality where Anne Boleyn gave birth to a legitimate, living son after Elizabeth. Unfortunately, Henry IX, known to his family and friends as William, pretty much self-destructed from rage and jealousy, and tried to take his two former friends, Dominic and Minuette Courtenay, with him. After his death, his older sister Elizabeth becomes queen and marries Philip of Spain. Twenty-two years later, Elizabeth is the target of the Nightingale Plot. She is divorcing Philip and fighting to make sure their daughter, Anne Isabella (or Annabel to her family), stays the Protestant heir to the English throne. Elizabeth turns to her oldest friends, Dominic and Minuette Courtenay, and their children for help. Of course, Minuette’s oldest daughter, Lucette, is also Elizabeth’s niece through William, and her mind is Tudor-sharp like her aunt’s. Walsingham sends Lucette to spy on the Courtenays’ old friends, the French LeClerc family. One of Renaud’s two sons is the Nightingale mastermind, but which one? Nicolas, the respectable, wounded widower, or Julien, the reckless charmer? In the meantime, Lucie’s brother, Stephen, is sent to help guard the imprisoned Mary Stuart, Queen of Scots, and may be falling under her influence. The last two Courtenays, twins Pippa and Christopher (Kit), are Princess Annabel’s best friends. But can they keep her safe? And what hope does poor Kit have when he realizes he’s in love with Anne, even as suitors start to compete for her hand? MY TWO CENTS: If you’re familiar with my blog, you know I love Tudor nonfiction and fiction…and I especially love these books! I’m just amazed at how the author has created this parallel world, and how decisions she made in the earlier books are addressed again here. (Example: Guildford Dudley didn’t marry Jane Grey, who never tried to usurp the throne from Mary Tudor, who was never a legitimate heir because Henry VIII’s marriage to Anne Boleyn was never invalidated. But Guildford did marry and have a son, who is one of Elizabeth’s favorites, like his uncle Robert before his execution.) The author must have TONS of notes on the ripple effect each historical change has on so many other factors. As far as characters, I liked Lucette even more than I did her mother, Minuette, in the earlier books. Lucie is a perfect blend of the best of the Courtenays and the best of the Tudors, yet still makes mistakes. For example, she’s so intelligent and quick at puzzles, yet the mastermind still stays one step ahead of her. I liked the other Courtenay offspring as well, and can’t wait to find out what Stephen does next, how Pippa develops, and if Anne and Kit can have a future. I could complain that I figured out where the Nightingale Plot was ultimately headed, but I think the ride was and will continue to be enjoyable. Also, the ending showdown was suspenseful enough to keep the reader guessing. After all, Andersen did prove in the first trilogy that anyone is expendable. My one tiny gripe, which is a really tiny stupid gripe, is…the title. 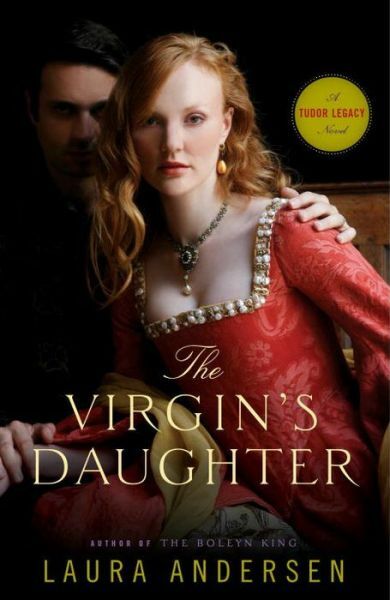 In this reality, Elizabeth was married for 20 years to Philip and bore his child, so she was never really “The Virgin Queen.” I realize that the title will attract those interested in Tudor historical fiction, but it kind of doesn’t make sense with the plot. Very, very small point, though. BOTTOM LINE: I love how Laura Andersen is careful to pull all the relevant threads into her world and make it a realistic “what if” scenario. I enjoy these books so much, and can’t wait for the next one, The Virgin’s Spy. ON SALE DATE: Available May 26, 2015, in paperback and eformats.